More and more people tend to raise the pet, such as the loyal dog, quiet turtle and the tender yet adorable cat. Why people have such a big crush on the pet, esp. the cute cat? The reasons mainly lie in that the pet are the spiritual and emotional sustenance for you when you are lonely and besides they can bring new vitality and joy into your life. Take the lovely cat for example, they often create some jokes by their rich expression or antics. And the owners capture these moments and upload the interesting cat videos sharing with the masses, among which the large number of funny cat videos receive a warm echo and attention, especially the longest 360 degree cat videos on YouTube. When I'm in low spirits, there is nothing better to cheer me up than watching funny cat videos, since their antics would split my sides and throw away my annoyance. I have watched countless funny crazy cat videos on YouTube and I scoured the Internet to organize the top funny cat videos on YouTube to share the amusement with you. Wanna enjoy these top funny yet crazy cat videos right now? Go to YouTube where you can be amused and burst into your laughter. But what if your network connection is poor or your wi-fi is on fritz? Needless to worry! You still have a once-for-all method-download funny cat videos from YouTube. Yet, currently the market is saturated with countless video downloading software, among which some are free but lack of solid ability to download the funny crazy cat videos in high resolution and others may need more efforts to make funny kitty videos downloaded. Can't find an almighty video downloader to free download funny cat videos from YouTube with ease and efficiency? Of course, you can. See, the omnipotent MacX YouTube Downloader is the very one you can count on, which applies its advanced tech to aid you to download any funny cat videos with whatever format or resolution, like the cute cat video in 360, VR, FLV, 3GP, MP4, WebM, RM, etc or the high definition crazy kitten video in 720P, 1080P, even 4K ultra HD. Assisted by its inherent High Quality Engine, this first-rate free YouTube funny kitten video downloader also gives you the capability of automatically adding the 1:1 lossless output MP4 videos to iTunes Library for transferring to iPhone XS/XR/X/8/7/6s/6/6 Plus/5S/C, iPad mini 4 Retina/Air 2, iPod Touch, iMovie, Final Cut Pro for playback, editing or any other further use. The award of the funniest cat goes to…? Your cat is the biggest winner? Step 1: Free download and run the funny cat video free downloader. Copy and paste the URL. Click "analyze" to load the cute cat videos or the funny cat music videos. Step 2: Choose video format, resolution and file size you want. 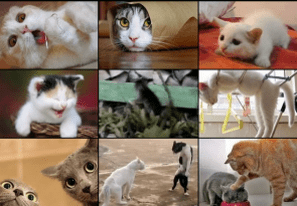 Easily download amusing cat videos in FLV, MP4, WebM formats. Step 4: Click "Download Now" to start the funny cat videos free download process. For Your Reference: Dream about watching these top funny kitty videos on iPhone iPad Android on the go? Resort to its advanced version-MacX Video Converter Pro, which allows you to convert the top funny cat videos to MP4, MOV, AVI, MKV, WMV, etc. such that playback the funniest cat video on portable devices for on-the-move enjoyment is just a piece of cake. Supposing you take a fancy to the top music videos on YouTube or something else but some of them are non-downloadable, take it easy! This superior video converter for funny cat videos will tackle this trivia by wielding its unique on-screen video recorder feature. With this function, you can also record hot music from Spotify, Grooveshark and more with the original quality preserved. Eager to watch the funniest cat video on YouTube? Click here to enjoy the vivid cat antics.